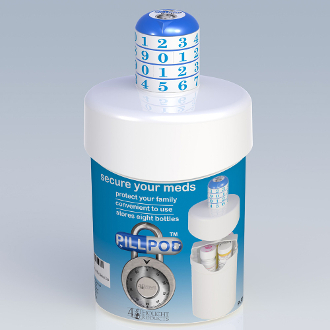 Pill Pod is a drug lock box for securing prescription medications and is intended to help prevent Rx drug abuse. It can also can safeguard marijuana and cannabis edibles stored in homes for child poison prevention. The product comes preset with a 4 digit locking combination assigned and requires no set up. Its portable size makes it convenient for use at home or while traveling and it can fit within standard four inch depth medicine cabinets. The container capacity can hold up to eight standard medicine bottles and can accept taller liquid bottles too. The keyless design is "pick resistant." Strong impact resistant ABS plastic with a "hinge-less" removable cover make it durable and prevent breakage. The design is tamper evident - any attempted break in can be easily identified. Pill Pod is intended to be used as a deterrent where no drug abuse or theft problem exists. It is not a high security drug safe. Warning: Pill Pod should not be used with any medications or materials that require quick access in a medical emergency. Copyright © 2011-2019 4Thought Products LLC. All rights reserved. Disclaimer: This site has no affiliation with Sony Columbia Pictures, Dan Brown, Leonardo Da Vinci, "The Da Vinci Code", or its publishers.